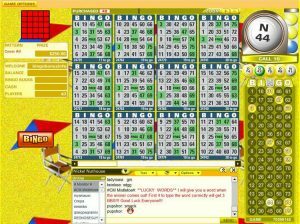 SouthBeach Bingo is an internet favorite offering over 300 bingo pattern & many online bingo rooms. Apart from bingo there is a range of other casino games such as Video Poker, Slots Games, Keno, and Pull Tabs. Players at south Beach Bingo can land a jackpot on any of the current rooms including Desperate Housewives, Fair and Square, Quarter, Nickels, Crazy, Dollar, and even practice their gaming skills in their free room. Fusion Room: 9am-11am every morning and 8pm-11pm evenings EST. Up to $5000 on two coverall games per hour for the 1st 50 calls. Win between $250 and $500 in dancing prizes. Also, high low prizes between $75-$150. Mid Day Specials: $500 in fixed prizes in their Dollar Room from 12pm-2pm EST. $100 fixed pots in the Quarter Room from 2pm-3pm. All stars Tournament: Tournaments 3 days per week. Up to $5000 cash on Monday, $1,500 Cash on Wednesday and Friday. Free Sign-up Bonus: $70 exclusive bonus thru Casino Encyclopedia. Newbie Deposit Bonus: 2016% welcome bonus on your first 3 deposits– 500% on your 1st deposit, 600% on your 2nd deposit, and 816% bonus on your 3rd deposit amount. Minimum Deposit Amount: $25.00; the minimum deposit amount may vary based on the payment method or currency. Wagering Requirements: Must play thru 3x the bonus and deposit amount. Birthday Bonus: Available – depending on the VIP level, players can earn from free bonus of $25 to $500. Also, any deposits on your birthday, earn you a 300% funding bonus. Referral Program: Available – players can earn 25% of their referred friend’s deposit amount. South Beach Bingo VIP Program: Available – 11 VIP levels ranging from Basic to Master, with increasing perks at each level. Deposit Methods: VISA/ MasterCard, Cheque, Money Transfers, Neteller, EcoPay, Bank Wire and Skrill (Moneybookers). Minimum Withdrawal Amount: $50; may vary based on payout method being used. Maximum Withdrawal Limit: Limit varies for each loyalty level. Maximum is $1500 every 2 weeks. Games Available: Live games, Poker, Blackjack, Roulette, and Baccarat. Video Slots- such as Pinocchio, 7 Monkeys, Good Girl Bad Girl, Alkemor’s Tower and Wild Sevens. Video Poker- such as Joker Poker, Deuces Wild, All American and Deuces Wild. Also, available are Keno and Pull Tabs. Software: Parlay Entertainment, BetSoft, Rival and Pragmatic Play. Customer Service Department: 24/7 support available through Email (support@southbeachbingo.ag). Live Chat when you login to your account. Facebook Page: @SouthBeachBingo; non acive account. Players can land bonuses & offers on South Beach Bingo on a daily basis with new promotions lined up for each day of the week. Deposit bonuses range from 250% up to 800% for deposits of up to $100 and more, depending on the day of the week. As part of a daily promotion, collect a raffle ticket for every deposit made during a certain time slot and stand a chance to win a $1000 bonus. You will find daily promotions on South Beach Bingo is the Lucky 5 offer available in the Dollar Room with speed games with fixed prizes worth $1000 on every 5th call and a guaranteed prize worth $100 up for grabs. The Supernova Room on South Beach Bingo runs a jackpot every day with prizes ranging between $300 and $600, and one Coverall per hour each night, with a grand prize of $7,500. Then there are weekly promotions happening in South Beach Bingo rooms that will keep you happy all week long. The Million Dollar Party Room is open every Saturday with guaranteed prizes of $1000 and a pre & post-game sessions with free fixed prizes up for grabs. Every Tuesday, Wednesday, and Thursdays during midday, players can enjoy Mid Day Special games in the Dollar Room with fixed $500 prizes. On Fridays, cash prizes can be won in the Dollar Room in the Fusion Fridays Tournament.